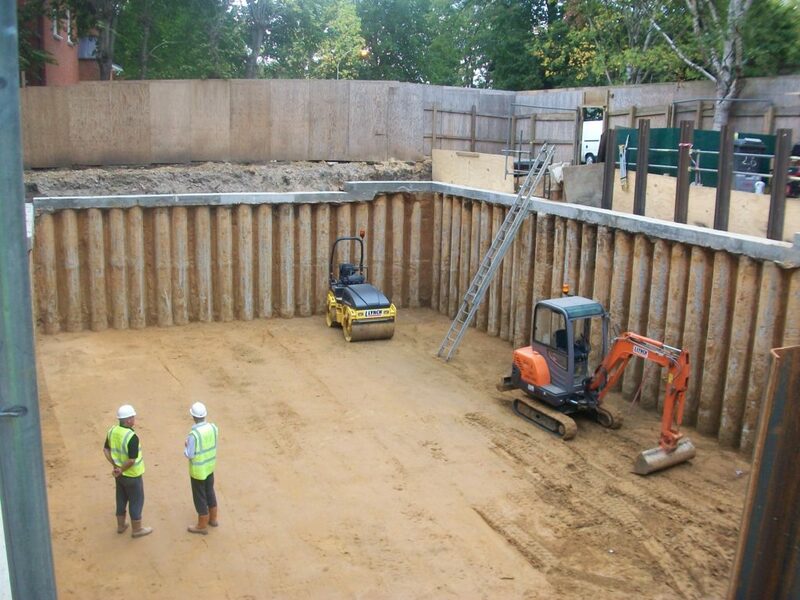 A twin waterproofing system was specified for the habitable basement at this high spec new build dwelling in North London – a sensible approach by the developer in view of the known high water table and the planned use of the basement as a high tech media room and home cinema. The new concrete basement structure was built by specialists, Togher Construction, and the watertight concrete system (comprising Triton’s TT Super Admix and associated joint sealing products) was supplied by Procon Readymix. Triton’s TT Super Admix conforms with the performance criteria of BS 8102 2009 as a type B integral waterproofing system. The product was dosed to the concrete mix at a ratio of 4.1kg per m3 of concrete, with a minimum cement content of 350kg per m³ of concrete and a maximum water ratio of 0.5. This type of concrete mix also enhances the concrete’s overall strength and durability. Triton’s construction joint sealing products, TT Waterstop and TT Swellseal Mastic were set in to pre-formed recesses within all the concrete construction joints and interfaces to prevent the ingress of ground water at these critical points. Triton TT Vapour Membrane, a highly versatile and elastomeric cold, liquid applied waterproof and gas barrier, was then used to coat all the internal block walls to a minimum height of 1.5m (to combat potential rising damp emanating from the slab via capillary action) and lapped out on to the slab – conforming to type A waterproofing criteria as per BS 8102 2009.
lt should be noted that all concrete, whether or not an admixture has been incorporated, has the potential for vapour and ground gasses to migrate through it. This is why TT Vapour Membrane was applied to the internal block walls set out on the basement slab to dramatically reduce the chances of rising / capillary active damp occurring behind any dry lined areas within the basement. A fully maintainable and BBA certified Platon cavity drained membrane system, conforming to BS 8102 2009 type C waterproofing criteria, was then applied comprising Platon Multi membrane to the walls and deeper profiled Platon P20 to the floors. Triton Aquachannel was installed to the perimeter of all the internal earth retaining walls to direct any future potential ground water ingress to two sump pump systems. These were installed in the external light well area at the front of the property for ease of maintenance. TT Vapour Membrane was also applied to internal surfaces of the light wells prior to Platon membrane being installed. These surfaces were subsequently encapsulated by rendered blockwork. All waterproofing materials were sourced from Triton, avoiding any potential for split responsibility issues and delivering one single source of technical support for all parties.